Sweet Sakura SweetLegs are the perfect sweet print for a picnic in the park. Delicate cherry blossoms and buds are adorned on a pearl aqua background surrounded by creamy white and fresh honeydew-colored splashes. Can you say gorgeous? Grab your favourite book and snuggle under a tree while pairing Sweet Sakura SweetLegs with a simple scalloped white t-shirt tunic, glittery black flats, and a braided straw messenger bag to hold your entire summer reading list. Fabulous choices with all the patterns and colours and they feel so great on. I don't know how I lived without them! I love my SweetLegs! The only pair that I had an ‘issue’ with is the Sweet Sakura. The material isn’t the same stretchy material as the other pairs of leggings. They fit okay in the thigh area. 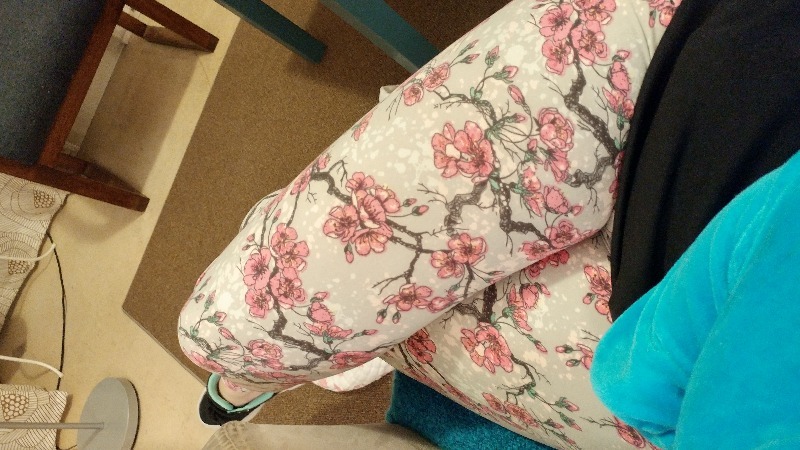 However, since the material isn’t as stretchy as the other, regular SweetLegs, I fond the Sweet Sakura very tight behind the knees and much snugger in the waist line. The material bunched up behind the knees and was very difficult to smooth and stretch out. I can’t wear them so will likely have to give them to someone who is much smaller than me or a child and cut them shorter. I got the regular, 'one size fits all’ pair. All of the other pairs were a perfect fit, sizing, and material. Very comfortable. Sometimes I have to make sure I'm still wearing them.